I was so excited to get a box of sample products recently from Urban Accents. I'm thrilled that grilling season has returned and look forward to trying out some of the dry meat glazes that were enclosed in the package over the summer. I love that this is a Chicago company specializing in premium, all natural seasonings to help take those ho-hum meals and kick them up a few notches. The first product I decided to try out was one of two Corn on the Cob Seasonings I received. 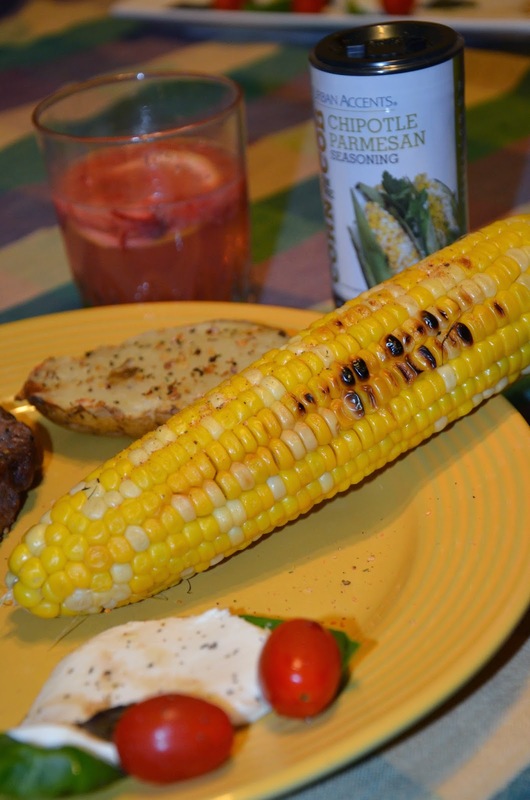 Corn on the cob is a common vegetable that we throw on the grill in the summer months. If you have never made corn on the cob on the grill, it really couldn't be simpler. I used to take lots of time removing the silk before grilling, but learned that you don't have to do that and that it actually removes easier after it's grilled. Simply take your cobs and put them in a sink full of cool water to soak them. I normally soak them for between one and two hours. It helps prevent them from quickly burning (which you can see from the picture I still managed to do) or creating a huge fire on your grill that will singe off your eyebrows. However, the silks and husks serve as a protective layer so that even if you burn the husks a little, your corn will still come out perfectly fine. In fact, I happen to like mine with a little bit of browned kernels. Soaking it also seems to almost steam it and you get a nice crunch, rather than a soggy cob like you would if you took all the time to peel away the husks and silk and then boil them. I usually put the cobs on the grill for maybe 20 minutes on medium to high heat. Once off the grill, coat with butter if you wish. The nice thing about this seasoning is that you're adding a layer of flavor and because of that I chose to skip the butter. Next time I think I will add it to some melted butter just to make it stick a little better. I have kind of a wimpy palate and am always cautious when I try out flavors that I expect to pack a lot of heat. This seasoning blend had the perfect amount of kick without setting my mouth on fire. It was a great accompaniment to one of my favorite summer side dishes. If corn on the cob is a frequent dish in your home, this is a great product to try out this season. The products can be purchased online at urbanaccents.com. If you've got a man in your life who considers himself "King of the Grill," you'll find some really nice gift boxes for Father's Day that he is sure to love with various combinations of their seasonings and glazes. 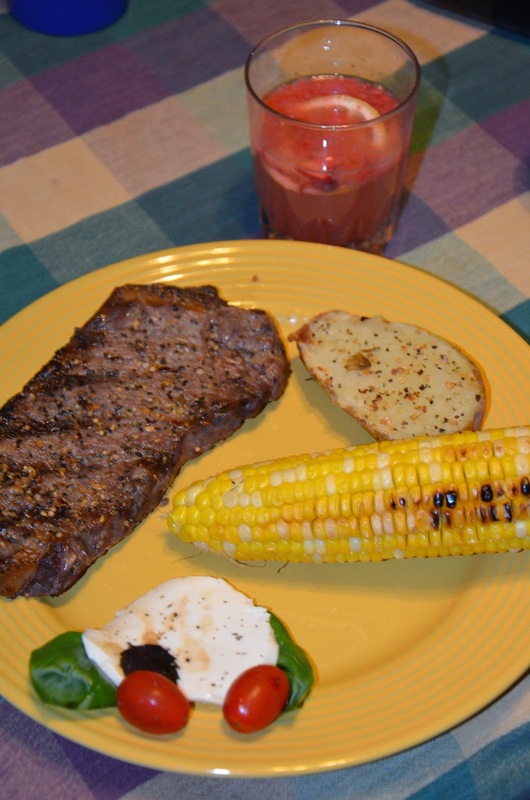 Our corn was served along with a nice New York Strip, a seasoned, grilled potato, Caprese salad and some homemade strawberry lemonade. ***Disclosure: I received complimentary product samples for the purpose of a review. All opinions are my own.